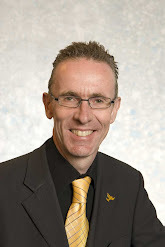 I recently – on behalf of residents – raised complaints about the state of the roadway in Bellefield Avenue and Seafield Road. I am pleased at the fast timeframe in getting the pothole at the south end of Bellefield Avenue as its a really deep hole in the road. 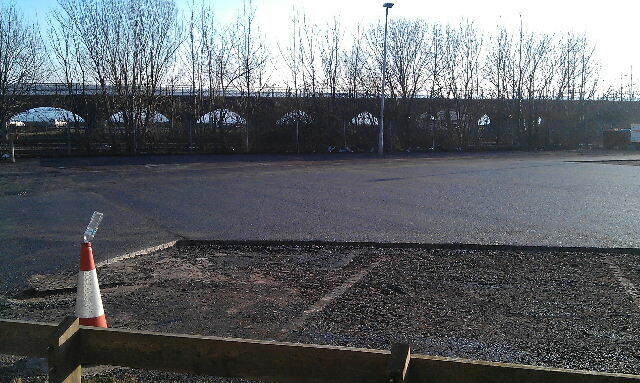 Roseangle car park resurfacing – looking good! “I carried out a site visit to Roseangle Car Park this morning and I can confirm that good progress is being made with the resurfacing works. I spoke to the Supervisor on site and he advised me that at the current rate of progress Tayside Contracts will need approximately 1 hour on Friday morning to complete the resurfacing of the tarmac. He also advised me that the parking bays in the overspill area will be marked out this afternoon and weather permitting, the remainder of the parking bays would hopefully be marked out tomorrow. The electrical work in Bellefield Avenue that was due over the past week but that Scottish and Southern Energy (SSE) kindly postponed at my request to ensure there was not parking space loss there at the same time as the Roseangle Car Park was closed for the resurfacing, will now go ahead starting on Tuesday – but the loss of parking spaces will be limited to one space outside the tenement block that SSE is working on. After many months of campaigning on behalf of local residents for proper resurfacing of the badly potholed Roseangle car park, I was pleased to advise last month that the City Council had agreed to fully resurface it and have it properly relined. 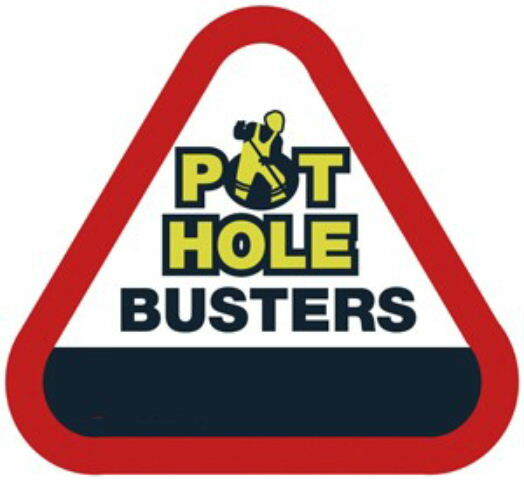 Slightly ahead of schedule, the council’s contractor, Tayside Contracts, will commence resurfacing works on Monday morning (27th – weather permitting), with the car park closed from teatime on Sunday for 3-7 days – the time taken will really depend on weather conditions. I have advised all nearby residents of the temporary car park closure and the City Council has also publicised this as has the Courier and Evening Telegraph. I was very concerned to learn yesterday that, by unfortunate coincidence, Scottish and Southern Energy (SSE) intended starting electrical work in Bellefield Avenue on Monday that would see a loss of parking in the street for up to three weeks – see right. 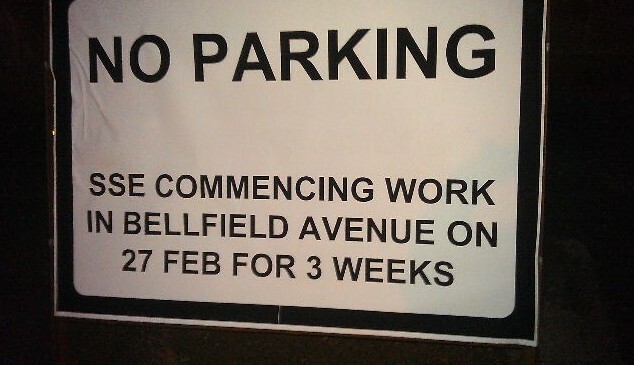 Arrangements are underway to cancel works that were scheduled to commence on Monday 27 February 2012. We will discuss with your Network Management department to identify a suitable time to reschedule. On a number of occasions, I have assisted residents in tenements where the stair lighting has failed. The council’s Private Sector Unit has been extremely helpful in such situations. I am therefore delighted that the council is now offering one-off awards of £100 per flat to assist with stair lighting repairs. One of the recurring problems has been in Bellefield Avenue and it is therefore good to see homes there being targeted for funding initially. Further information is available by calling 436880 or by email – private.sector@dundeecity.gov.uk. Over the past few months, I have had a number of concerns expressed to me by constituents about situations where the communal lights on the stairwells of tenements fail. 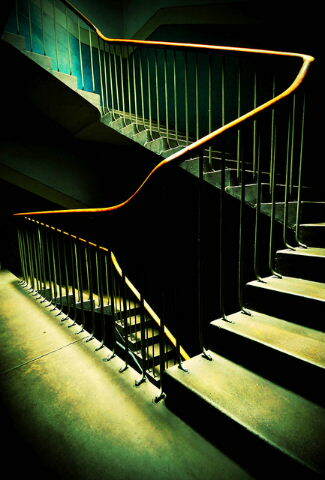 This plunges the stairwell into darkness with obvious health and safety implications. Just before Christmas, most of the lights on one side of Bellefield Avenue failed together as the wiring is communal and it was very concerning that a number of blocks of flats had no stair lights until that particular fault was detected and sorted. There have been other examples of the stair lights failing in blocks in the West End and its bound to happen from time to time in tenement blocks where the wiring is old. 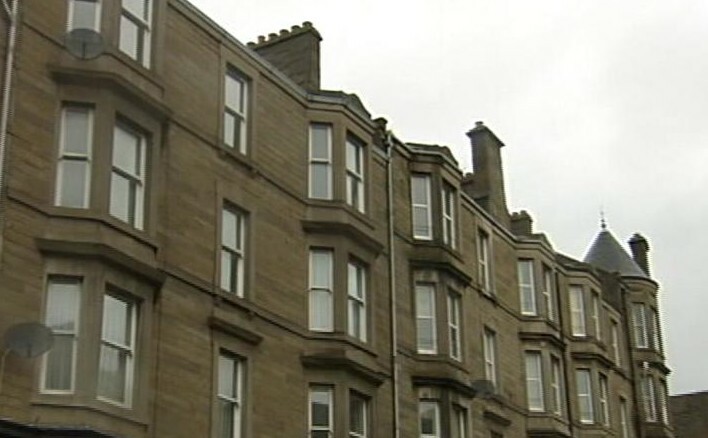 Given that owners are communally responsible for repairs, getting repairs done can be complicated where a number of flat owners are involved, particularly where there are non-resident landlords. “Grant assistance is available towards common repairs where the cost per flat exceeds £500. In calculating any approved cost of works we will also take into account savings above £6000. The owners may wish to engage an electrician to test and report on the installations and obtain estimates. The overall cost to each owner will, as indicated above determine whether individually they will be eligible for grant. The team can be contacted on Dundee 435400. 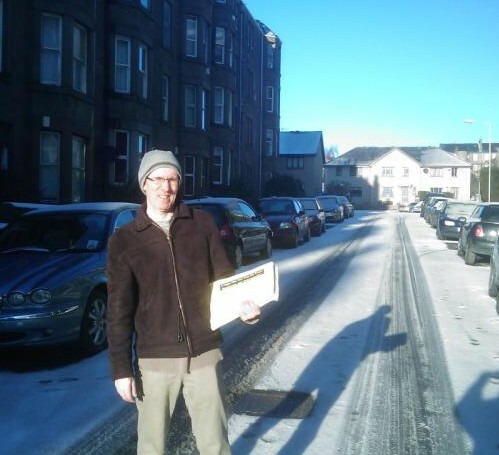 The Liberal Democrat team was campaigning around the West End today – here’s a photo (right) of a rather cold Fraser in Bellefield Avenue this morning! It was good to chat with residents on a variety of local issues – including graffiti and winter maintenance. I’ve been trying to assist the residents in many of the tenements in Bellefield Avenue over the past few days to get the stair lights on. This is a problem that first emerged 5-6 years ago when all the communal lights went out in the 8 of the 9 tenements on the west side, plus 47 Magdalen Yard Road. With the help of the council’s Environmental Health team and Scottish & Southern Energy, the problem was sorted on that occasion. 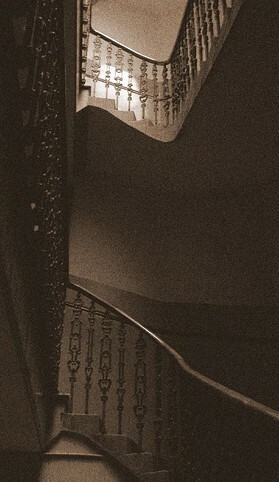 This time, the same tenement stair lights went off, but also some on the east side. On Friday, at my request, an officer from Environmental Health and Trading Standards at Dundee City Council visited the street but there was some difficulty in locating the source of the problem. However, as of tonight (and earlier in the case of part of the east side) many of the lights are back on, but I am hoping to progress a proper long-term solution by getting owners together to agree a full survey of the stair lighting system here.